The first time I consciously checked the dictionary for the meaning of ‘Broad-minded’ was after I had an encounter with a lecturer in my first year in the university. A group of students and i had gone to him to confirm our registration for his course. The said lecturer was always stern with students and he had a victim when we arrived. I heard the lecturer call him myopic and was asking why the student did not think outside the box. Apparently, he had written an essay that was one-sided. (In his words, the essay lacked insight). He went ahead to give everyone a crash lecture on why we should be broad-minded if we wanted to do well in the university. I made a mental note to check the meaning of ‘myopic’ and ‘broad-minded’ and I agree with him- to get the best out of our goals we should be broad-minded but have bouts of doubt here and there. 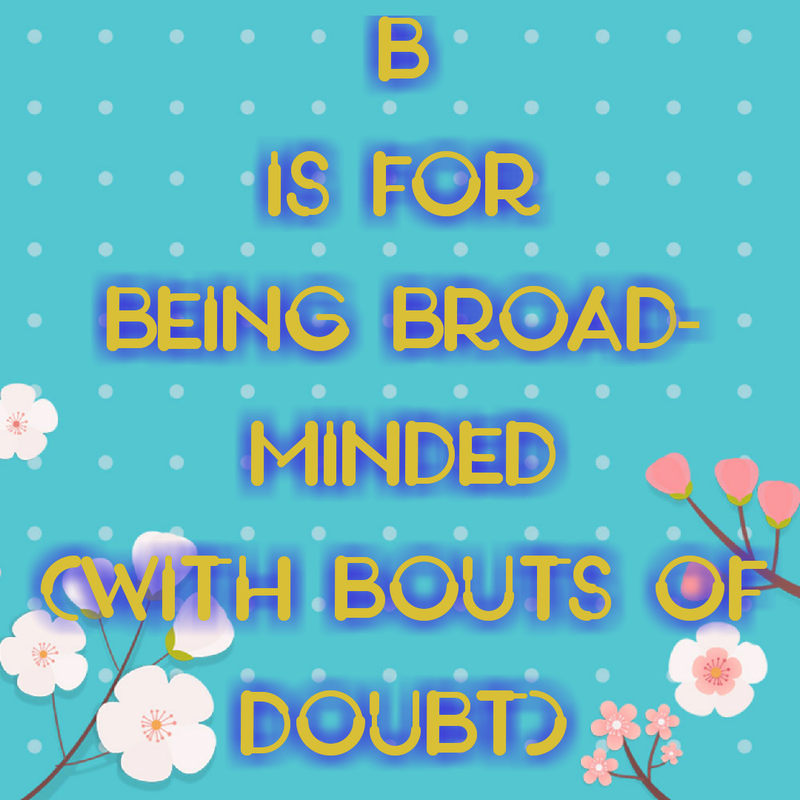 I added ’bouts of doubt’ because if you are like me you will question everything. As humans, we like to stick to the story we know better, the experiences we have had or the media coverage of a place or issue. This is dangerous because it limits our chance to gain more knowledge. While we like to say, ‘Experience is the best teacher’ we need to also acknowledge that we all have different experiences (or way of doing things) which may give the same result or give a totally different one. This is why I never understand when someone tries to ‘enforce’ his/her opinion(s) on me. I mean, I have my opinion and you have yours. The best we can do is to reach a ‘healthy agreement’. However, we can only reach a healthy agreement when we are open-minded. 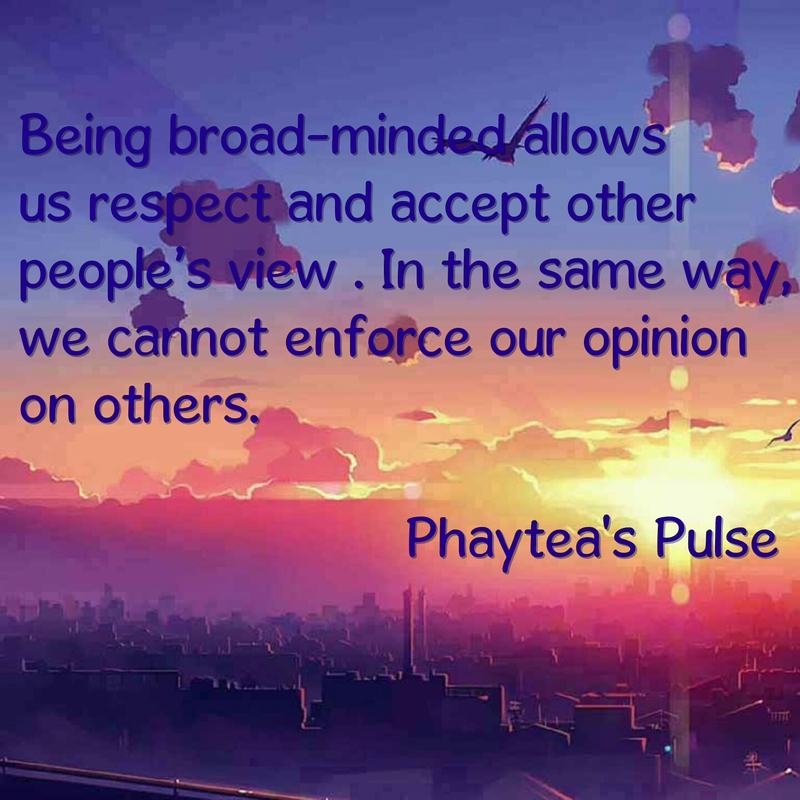 Being Broad-minded allows us to understand, respect and accept other people’s view. This is very important if we intend to achieve success as a team or as an individual. In life, there will always be people who think differently, people who do not share the same sentiments as us and the way we respond shows how much control we have of our thought process. The truth is, we cannot go around arguing with everyone who has a theory that is different from ours. Situations like this have caused altercation between friends, in relationships and even in the workplace. Being broad-minded keeps you away from unnecessary conflict: I have seen and heard people quarrel over conflicting opinions. This can be contained if we accept the fact that we will always have different opinions. A healthy agreement is always encouraged. My Pandora’s Box: Honestly, I try to be broad-minded, but I will argue if you try to ‘enforce’ your theory on me and fail to understand that I have my ‘own’ opinion. Nobody enjoys accepting an opinion by force. True? You have a better relationship with people: When we are broad-minded, we understand people better, tolerate their behaviour and even have the patience to explain things clearly. You can always find a common ground. It makes you a good listener: The willingness to accept ideas means you are ready to listen. You talk less and listen more. Keeps you informed and you get more facts to work with: Since we are receptive to opinions, information gathered can be filtered or adjusted to suit a purpose. You will make a great conversationist: and I think that is awesome…with all the knowledge you have, you will always have an opinion to share ‘nicely’. No man is an island of knowledge and being receptive to new information allows us achieve even better results. As much as willingness to accept ideas tilts us towards our goal, being broad-minded does not mean we MUST always take in everything we hear completely. We should have ’bouts of doubt’ and that should be because we are curious, we want to know more and we need to clear all assumptions. By doing this, we give ourself the opportunity to learn and unlearn and that is good for living a meaningful life. The world is evolving and we have to be up to date. So by all means, be inquisitive, ask questions, research, understand and accept people’s culture, do not enforce your opinion on others and respect their opinions too. You are more confident about an information when you clear assumptions and find the answer yourself. If you enjoyed reading this, please share your experience if it is/was difficult for you to accept other people’s opinion. Are you more receptive/ broad-minded now? Have you also noticed you achieve better results when your opinions are in sync with that of your colleagues, friends or partner? Tell me in the comment section, i will love to read from you. Love this! I absolutely agree with broad-mindedness helping in relationships. I have close friends whose opinions vary greatly from mine, and we know that about each other, yet it works because we focus on the commonalities while honoring the differences. The relationships that crumble are those that live in a black-or-white world. Being broadminded is a great quality, but it needs to be balanced by an awareness of what our core values and beliefs are – otherwise we’re swayed by every new idea and we begin to accept things that aren’t necessarily true or good for us. Its really great to have such thoughts, keep it always like this, do not change yourself for anyone. God bless..
Nice post! It is so important to be broad-minded. Like you said, not everyone is going to have the same opinions as you, but no one should be attacked for their opinions, nor should anyone’s opinions be forced on anyone else. Rather, we should accept that others have differing views, and although we may not be convinced of them, we need to be open to hearing them. Thank you for sharing these thoughts. I think a broader mind is something we could all benefit from. You can learn so much from people that have differing viewpoints than you. Spot on. I moved from being narrow minded to being broad minded, but I sometimes think I’m a bit too opinionated. Now I’m learning that I don’t always have to give my opinion even if I have one! 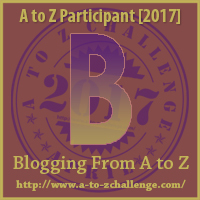 Visiting from Blog Share Learn. Previous Post Acceptance (Love yourself, Flaws and All). Next Post Communication (words are not enough).